Not sure what to write today. Haven't planned anything so will just wing it. Outside, the skies are blue but it is still a little chilly. It's nice to see a bit of sun though, I might spend a bit of time in the garden later after I do a good bit on my MS. I'm finding it tough to finish. I don't know why exactly. I suppose it's to do with all the distractions lately, there has been so many! I was writing in my notebook mostly. Have to type it all up now but at least I'll catch mistakes easier. Last Tuesday, we got a dog. We are fostering her for three weeks before we can officially adopt her. Her name was Pep before she came to us, Beth has renamed her Pepperoni Pink Flower. 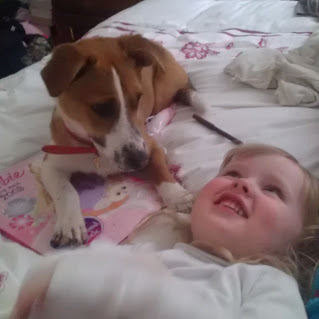 She is a large Jack Russel Terrier and is so cute, she was even house trained! It's been a bit of an adjustment but not completely different to how it was before. Just out in the park everyday, standing in the rain while she does her business, no major changes. She wants to sleep in Beth's bed every night but I'm not letting her. Would be afraid she'd scratch her by accident or Beth would wake her in the middle a bad dream and Pep would turn on her. On Saturday 13th April, a dazzling bride walked down the aisle of the church. 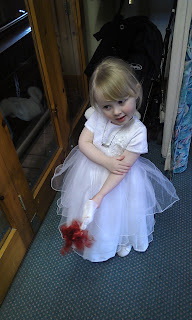 She was preceded by her gorgeous flower girl goddaughters and three beautiful bridesmaids in pink. It was a lovely service and, as always at weddings, there was a tear in my eye. The weather was not the best unfortunately. What was a medium wind when we entered the church turned into a gale force wind by the time we exited. The rain was also coming down in torrents. The church itself is situated on top of a small hill on the coast. It is also where Beth was christened in 2010 and I had my First Holy Communion in 1988. We had a great view of the white horses thrashing the beach as we ran to the car. Of course, my hair was ruined! After a brief stop for sandwiches in a friend's house, we made our way out to Cabra Castle in Kingscourt, Co. Cavan. Beth and I checked in, ooh-ed and aah-ed at our room (and massive bathroom), and then went to the reception. The food, atmosphere, speeches were all very enjoyable. I even spent most of the time partaking in adult conversation! Beth and the flower girls had great fun together. We left the party at around 10.30pm. Beth doesn't like loud music and, wow, the band were loud! We were up early the next day, checking in with the bride and having a big breakfast. Beth and I wandered around the grounds a bit after breakfast before heading off at 11am. Thankfully, my friend Anthony was very good to drop us (and collected!) to the airport. The turbulence out of Dublin was terrifying. I did my best not to show how scared I was in front of Beth. She was loving it and squealed every time the plane jumped. Luckily, the landing in Blackpool was nice and smooth. My Dad collected us from the airport and we went to the hotel, after a brief stop in with his new wife's family. There I met with her daughters and their children. The youngest granddaughter was a little jealous of Beth but that's perfectly normal at her age (3). We stayed at The Melville Hotel (click here to see my review). It was perfectly fine and typical of the type of accommodation you would find in a UK seaside resort. We were treated very well by the staff, well, apart from waiting forever for breakfast on the last two mornings! On the morning of the wedding, Beth, Dad and I walked the twenty minutes to the Methodist Church. We had a quick coffee while waiting for the church to open (we were quite early). Beth explored the church until Imelda showed up five minutes early. 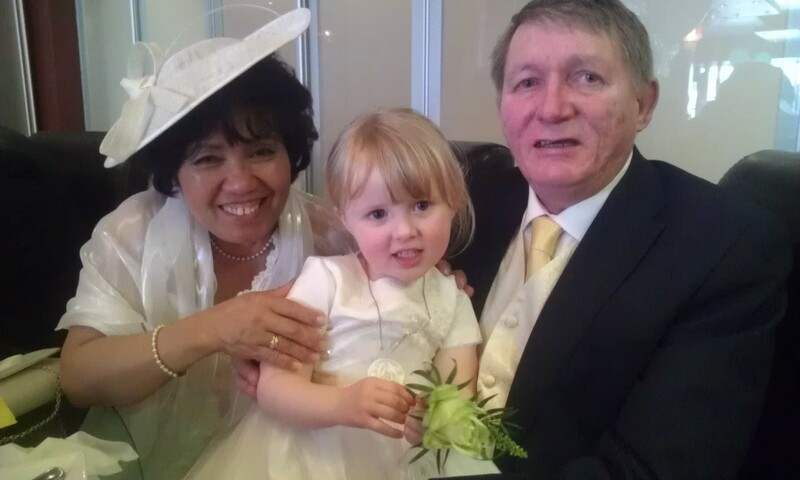 Beth held the eldest granddaughters hand and walked down the aisle. I was so proud of her. All the ladies were in white, with Beth and the bride holding bouquets of green, yellow and white. The service was different to the one in Ireland but no less special. The female minister was very friendly. 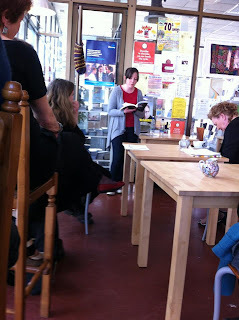 The eldest granddaughter and I did two readings, the same readings that were read at Deborah's wedding on the Saturday. Rings were exchanged, blessings given and then it was time to eat. We went to The Zen Restaurant in St. Anne's. 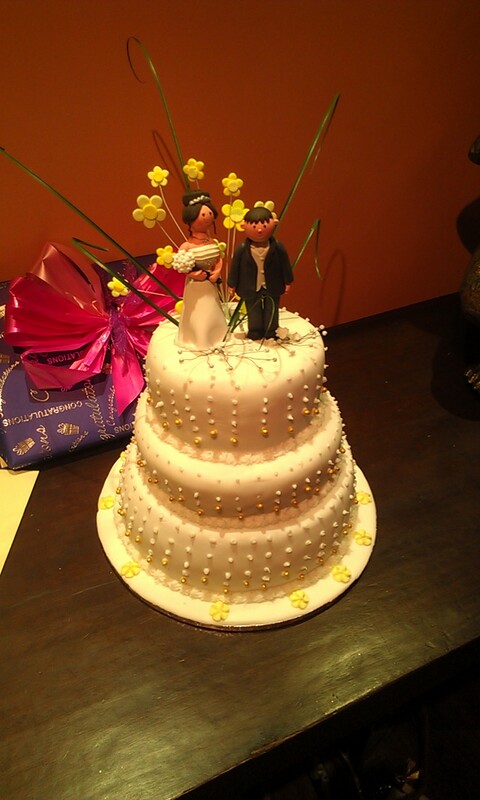 Food was fantastic and the wedding cake was divine. 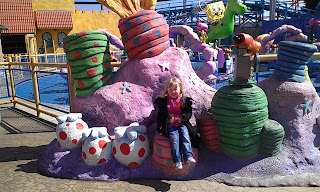 On the Tuesday, Beth and I went to Nickelodeon Land at Pleasure Beach. It was so much fun!! I won a huge Spongebob Squarepants for her (delighted with myself). It was tough squeezing him into the suitcase! We relaxed on the Tuesday night before we had to say our farewells on the Wednesday. The flight out of Blackpool was nice and easy but Dublin, again, was a nightmare. There were only a few people on the plane. It was one of those small propeller yokes that need a push down the runway. Out of about twenty passengers, six were children, including Beth. The delighted shouts and weeeeees with the turbulence almost made it bearable. And that was the end of our wedding adventures! 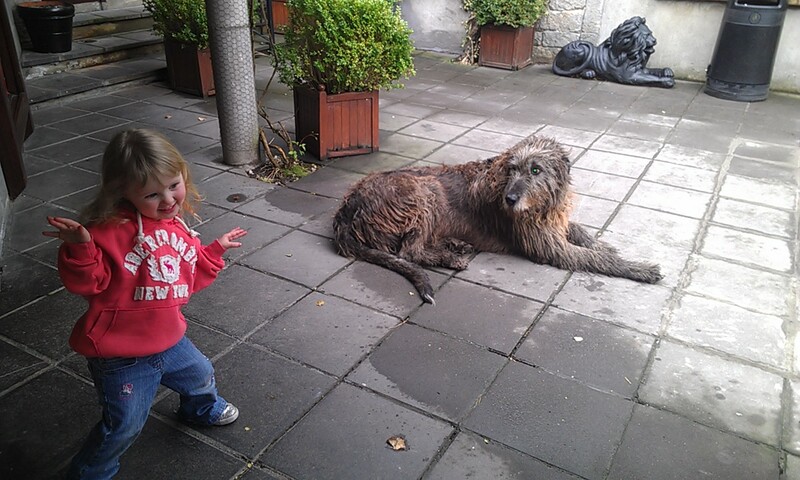 The big news I have is that we are getting a house visit from the Dundalk Dog Rescue this evening. We are getting a dog!! I'll have photos and more details when we get one but for now we just have to be checked out and sign some forms. We're so excited! My blog!!! Three years ago on this day I started this blog with this post. I originally started the blog just to document what was happening with Beth and her development but quickly turned into a bit of everything, including my new career as a writer. Tomorrow, I will do a long post on the weddings and Blackpool, but for today I'm just saying Happy Birthday and a few photos. We've some exciting family news that I'll reveal tomorrow too!! Full nights sleep? What's that? This Saturday is my friend Deborah's wedding. I'm very excited. Beth is too, it'll be her first wedding. The reception will be held in the picturesque Cabra Castle and we will be staying over. However, there will be no sleep ins for us. At 11am the next day, we will head off to Dublin Airport for our flight at 2pm. We'll wing our way to Blackpool, arriving at 3pm and picked up by my Dad. The following day, at 2pm, we'll watch Dad marry his partner Imelda. Beth will be flower girl. 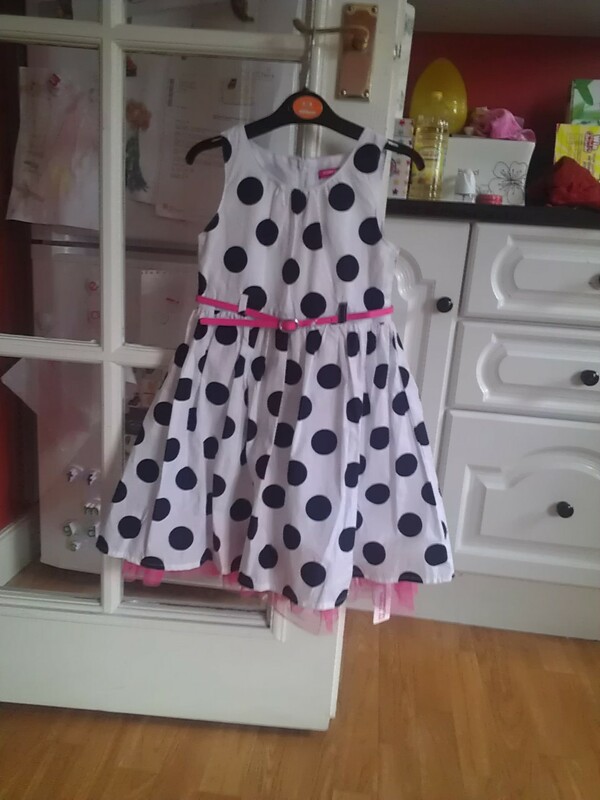 She can't wait to dress up like a princess. 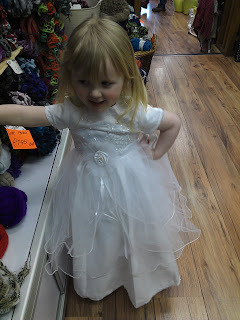 This is her flower girl dress. There will be a gold ribbon around it to tie in with their colour scheme. We'll be staying in Blackpool until Wednesday. Tuesday we will relax, explore a bit and spend time with my Dad, who plans to move to the Philippines in two weeks. He has lived there before and we keep in contact via Facebook. The problem is this is the first time I'll be taking Beth away on my own. Last year, when we went to Spain, I had my sister to help with everything. Now, it's just me and a little girl who thinks she's a teenager. I'm having nightmares every night where Beth disappears, or something happens (in one dream, she was spirited away by penguins!!). Deep down I know everything will be fine but my over active imagination likes to play havoc with my stress levels. I need rescue remedy or failing that, a stiff drink! I'll be in the local paper, the Argus, today. A little piece on my book, now for sale in Carroll's Book Shop, Dundalk (Ireland, not Maryland). I'll also be doing a reading at Dundalk's Book Festival in the Panama Cafe on the 27th April. I've started working on my flabby arms. They tend to jiggle a bit. I don't have weights so I'm just using two tins from the press. No results so far but hopefully soon. I can feel the aches when typing! Although I knew my Dad was planning to get remarried soon, I was not expecting the phone call on Saturday to say he booked the minister for 15th April. While this is great news, I also have a wedding on the 13th April! On the 13th April, my very good friend is getting married. Beth and I have been looking forward to this day for months. We've had our outfits planned and our little jobs at the wedding assigned. The ceremony is in a little village outside Dundalk and then on to Cabra Castle in Cavan. We are also staying the night in Cabra Castle. I can't wait as it is supposed to be fantastic! On the 14th April, we will leave Cabra at around 11.30am (before check out!!) and head to Dublin airport. There, we will catch a plane to Blackpool, UK. It'll be our first flight just the two of us. Arriving in Blackpool at 3pm, we'll then be picked up and brought to the hotel for Beth to meet Dad's future wife's family. I have met some but not all. Will be fun. On the 15th, at 2pm, Dad and his partner will tie the knot. I'm not sure where the reception will be yet but, undoubtedly, it will be great craic. It'll be a busy few days for the two of us!